Veterans and active-duty military will get free admission to the 41st annual Wellesley Marketplace, an annual arts fair at Wellesley High School, on Veterans Day, Nov. 11. The event is being held one week earlier than in past years, when it was held on the Saturday before Thanksgiving. “We’re so happy that we can offer free admission as a way to honor our veterans and active service members on this special holiday,” said Marketplace chairwoman Meryl Glassman, of Wellesley. 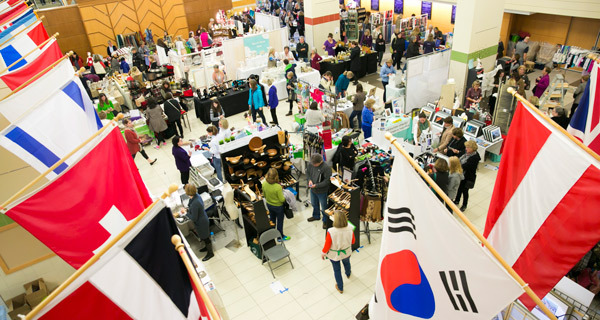 Marketplace is an annual retail favorite - and the unofficial start of the holiday season- for those seeking unique locally made gifts for family and friends. Shoppers will have access to about 200 vendors and artisans from New England and afar. Available wares include gourmet foods, handmade jewelry, artwork, home accessories, dog toys, and even dolls’ clothes. This will mark the second year in a row that the event will be held at the recently-renovated Wellesley High School. Last year, Marketplace drew a crowd of 1,700 shoppers, including about 500 who paid for premium admission tickets to get into the show early. Last year, WHJWC awarded $70,000 in college scholarships to 44 Wellesley high school students in amounts ranging from $500 to $2,500. WHJWC also gave $70,000 in grants to Wellesley-area community groups.